For a long time, yogurt has been touted for its health benefits, ranging from gut health to possibly contributing to weight loss.1 Did you know yogurt is full of probiotics, calcium, protein and many other healthful nutrients? However, yogurt can be chock-full of sugar. Many single-serving yogurts contain as much sugar as a Snickers candy bar! But yogurt can be part of a healthy balanced diet. Knowing how to read the label can help you decide which ones to buy and which ones to leave out of your shopping basket. Yogurt is a great source of protein, especially the Greek varieties. Protein is digested more slowly giving you energy from your food over a longer period of time, and may keep you satiated longer than carbohydrate-rich foods.1 This is why having yogurt at meal or snack times can help stave off the munchies later. Yogurt is bursting with minerals including calcium, phosphorus, and potassium.2 Calcium in yogurt is more easily absorbed in the body compared to non-dairy calcium sources such as green leafy vegetables or soy milk. Calcium and phosphorus are especially important for building strong healthy bones. I’m lactose intolerant so I can’t eat yogurt. I don’t eat dairy so I can’t eat yogurt. False! Vegans are individuals who don’t eat any animal products and may avoid dairy for a number of reasons. If this is true for you, finding a dairy-free yogurt alternative can help you still enjoy the taste and texture of yogurt. Alternative options include soy, coconut or almond milk based yogurts. Look for varieties that are lower in sugar, particularly those that are unsweetened, have probiotics added and are fortified with calcium. All yogurts are high in sugar. False! Sugar levels vary between types and flavors of yogurt. There is about 12 grams of naturally-occurring sugar in a plain 6 ounce container of yogurt (this may vary). 6 Higher levels on the label suggest that extra sugar was added from fruit or added sweeteners, such as dried cane syrup, agave, and honey. 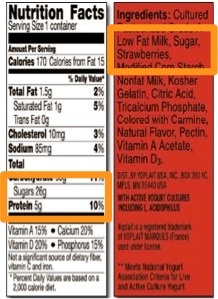 It is important to read the ingredients and nutrition facts label to find yogurts with lower added sugars. 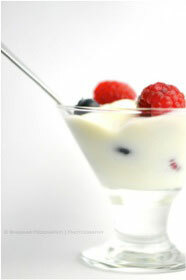 If you prefer the taste of sweetened yogurt, try balancing out your sugar intake over the day. For example, instead of having yogurt during the day and a helping of dessert in the evening, swap out the dessert and have the yogurt instead. You can also try sweetening plain yogurt by adding fruit. Being mindful of how much sugar you’ve had each day will allow you to maintain a balanced diet while still enjoying some of your favorite foods. *This flavored traditional yogurt has 26 grams of sugar, about half in the form of naturally occurring lactose and the rest from added sugar and strawberries. *Also notice the amount of protein: 5 grams. *This plain Greek yogurt has 9 grams of naturally occurring lactose and no added sugars. Notice the only ingredient is milk. *Also notice the amount of protein: 22 grams. Greek yogurt has been under the media spotlight recently and for good reason. As you can see from the nutrition facts label above, the Greek compared to the traditional yogurt has less sugar and more protein, but there are a couple things you need to know before you start stocking your fridge with only Greek varieties. Greek yogurt is strained, which is why it has more protein and less sugar than traditional yogurt. Straining can also remove some of the sodium, whey and calcium content. Some Greek yogurt varieties are high in fat and can be very costly. Look for low-fat varieties and if your grocery budget is tight, purchase Greek yogurt when it’s on sale or stick to the traditional yogurts. 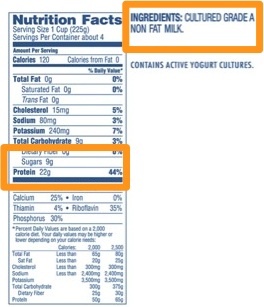 Just make sure to check for low added sugar content when purchasing traditional yogurt. Top yogurt with berries and granola to eat as a snack or for breakfast. Substitute Greek yogurt in place of sour cream. Freeze and enjoy as frozen yogurt. Plain and unsweetened yogurt makes a great addition to not only sweet, but savory recipes, too! 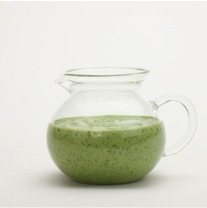 Create yogurt-based salad dressings such as cilantro-lime dressing (see recipe below). The addition of plain yogurt provides protein and flavor without adding added sugar. Replace half the butter with half that amount of yogurt. Replace half the oil with ¾ that amount of yogurt. Go Greek! Greek-yogurt is higher in protein and usually lower in sugar. Combine all ingredients into a blender or food processor and process until smooth. Serve on any salad of your choosing. Keep refrigerated. Halton LT, Hu FB. The Effects of High Protein Diets on Thermogenesis, Satiety and Weight Loss: A Critical Review. Journal of the American College of Nutrition. 2004; 23(5):373-385. doi: 10.1080/07315724.2004.10719381. Dairy Council of California. Yogurt Nutrition. Accessed October 3, 2014. American Gastroenterological Association. Probiotics: What They Are and What They Can Do For You. May 2013. Accessed September 25, 2014. National Yogurt Association. Don’t Be Fooled: Not All Yogurts Are Created Equally. Accessed October 23, 2014. Savaiano DA. Lactose Digestion from Yogurt: Mechanism and Relevance. Am J Clin Nutr. 2014; 99(5):1251S-1255S. doi: 10.3945/ajcn.113.073023. Eat Right. Why Does Yogurt Have So Much Sugar? Accessed September 25, 2014. Taste of Home. Yogurt for Lower-Fat Baking. Accessed September 29, 2014. I grew up on the Oregon coast in the small town of Warrenton where I met my high school sweetheart and married shortly after graduating from Clatsop Community College with my Associate's degree. I transferred to Oregon State University to pursue my love for nutrition. At OSU I had the privilege of being involved in the Nutrition and Dietetics Club which I served as webmaster for my senior year. I graduated from OSU in the Spring of 2014 with my Bachelor's degree in Nutrition. My passion for nutrition started in high school and has grown so much since pursuing a career in dietetics. I am interested in working in many areas of dietetics, including renal, oncology, sports nutrition and public health. When I'm not studying nutrition, I enjoy exercising, reading, playing piano, going on adventures with my husband, cooking up new recipes in the kitchen and working on my blog, bellyfullofkale.wordpress.com.